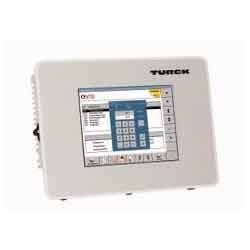 Our range of products include Turck System Solution such as Wireless System, Pick To Light, Metal Detection, Industrial Image Processing, HMI Operator Panels and IO Link. We offer Metal Detection.Many applications require fast material recognition. 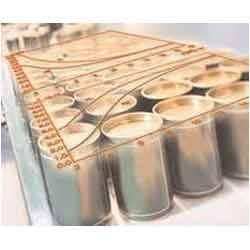 For example, sorting aluminium or tin cans, or differentiating between pipes of different metals that are produced in the same plant. Turck has developed an analog inductive sensor for this purpose that processes the amplitude and the phase signal. Both signals are output as analog values and can be processed mathematically with the programmable I/O systems BL20 or BL67. Different metals are thus detected regardless of distance. We offer HMI Operator Panels. The HMI touch panel with a 5.7“ TFT display can be used both, as operator and control terminal.The control system used is Co De Sys V3. It is approved according to the international standard IEC 61131 3. QViS, is the visualization software used. It was especially developed for embedded systems.Variables are exchanged via interface between control unit and visualization. The HMI panel is equipped with all relevant RT Ethernet and fieldbus systems. We are offering Pick to Light systems.Pick-and-place errors which occur during the assembly of complex products are difficult to correct afterward. Opto arrays resp. light screens provide a considerable plus in safety and are at the same time a very cost-efficient solution. Increasing demands on the quality and efficiency of production processes require well structured and error-free work processes. The sequence of assembly processes for example is of high importance. In order to achieve zero-defect picking, feedback to the process control is mandatory. We ofeer a wide range of Input Output Link.Flexible production processes and precise product tracing require a seamless communication network up to the sensors and actuators. 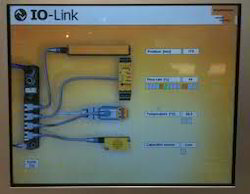 The fieldbus- neutral communication standard IO-Link is the solution for these demands. Devices which had to be mounted in well accessible places for operation, can now be mounted precisely where needed, thanks to IO-Link. The devices are configured via the central control system and parametrized either via the control system or via engineering tools such as FDT/DTM for example. Costly commissioning times are thus considerably reduced. Thanks to the seamless communication, the operator is now able to respond flexibly to new production events during operation. Configuration settings for product changeover are changed remotely via IO-Link, for instance. The same applies to the exchange of IO-Link devices for maintenance purposes. Parameters as well as configuration data are directly transferred to the new nodes.